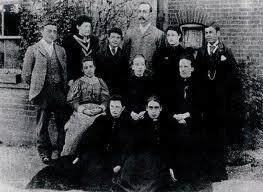 Rochford Primary School was established as the Rochford County Board School almost 140 years ago. It first opened its doors to pupils on 29th September 1873, when the Master of the Boys’ School was one Henry Found. From the Log Books (which every school manager was obliged to keep to record the day to day – and out of the ordinary - events affecting the school), we gain a glimpse of life in a rural primary school over the last 130 years. It is clear from his entries in the books that Master Found and his successor faced their fair share of challenges, some of which would be recognised by head teachers today (unruly classes, insufficient funding and simply not having enough hours in the day). The absence of children due to harvesting and potato season is now, obviously, a thing of the past but youngsters not so very long ago were still expected to help their parents out on the land rather than attend school. Before 1870, education in England and Wales had been a private matter (for the wealthy) or provided by the church. Under the Elementary Education Act of that year, Boards of elected members were set up to ensure that an elementary education was provided in areas where the existing provision was inadequate. Schools still charged fees, which was obviously a disincentive for poorer families to send their children there when they could be out earning a wage. Children were required to attend school between the ages of 5 and 10, although in agricultural areas (such as Rochford) it was generally accepted that this would not be possible. Another Act of Parliament in 1880 made attendance compulsory between those ages, and Attendance Officers were employed to enforce this (generally, without much success). On 6th October 1873, Master Found noted that the number of children on Rochford Board School’s register books had reached 76. One can trace the outbreaks of infectious diseases – measles, ringworm, Scarlet Fever – and the effect they had on local populations. These, and the regular itinerary of shows, fairs and carnivals, gave Masters something of a headache. For example, the entry for 20th May 1874 reads: "Began school in the afternoon at 1.30 as several boys wished to leave early to attend a public tea at the Exchange"; and on 30th June that same year: "Short numbers at school today. Many children attending a tea in Mr Woods’ field." And on 15th July – “Low numbers at school today it being Rochford Fete Day”. "A Bank Holiday today, but no holiday for teachers ..."
You can almost feel Master Found’s frustration as he writes, on 29th March 1875: "Bank Holiday. No holiday for teachers but a considerable proportion of the children kept it by absenting themselves from school". And on 27th September, “attendance again low. Langers’ Circus at Southend forming another attraction to lead boys from school”. In the 1930s, epidemics of influenza and scarlet fever kept children away from school from time to time. On a more cheerful note, Armistice Day was marked with marches to Rochford Square and Empire Day was an important event in the school calendar too. Were you a pupil at Rochford Primary, or at any of the other schools in the district? Why not share your memories? Register as a contributor on the home page and you're ready to go. This page was added by Helen Barnard on 28/01/2011. Yes, I well remember ROCHFORD PRIMARY school, I was there from 1949 to 1953. A very happy time with good memories making friends with many young people. The headmaster, Mr Baltrop ruled with a rod of iron and everyone gave him the respect he deserved. Getting the cane from him was a serious matter! Over the road from the main school were some newer buildings and the sports field with 80 yard running track (not enough room for 100 yards). This area was close to the railway track and the ever popular Ironwell Lane, great for adventures. Hello Sarah - I've just passed your request to Julia Smith (see first comment below). I am trying to trace any relatives of Harry Chapman to ask permission to use an oral history recording we have of him at the Essex Sound and Video Archive. If anyone has any contact details, I would be grateful if you could let me know: sarahjoy.maddeaux@essex.gov.uk. I was a pupil at Rochford Primary School from 1944-51. I think one of my teachers was a Miss Ambler. I recall catching newts and tadpoles in the stream below the bridge opposite the school and using the air raid shelter across the road in '44-45'.